The person or family who have large weddings these days have to be cognisant of the "drinking and driving laws" in the USA. The fact that the organiser or the family ( or both) could find themselves in court if there ever is an accident "on the way home" from the event is something that must be considered because the wines are "free". Many of these parties supply bottles of wine on each table at the event. This is potentially a real problem. Why not make those bottles alcohol free wine? You may be able to control the consumption of alcohol at the "bar" but what if one of your guests also consumes one or two bottles of wine at the table where they are sitting. We all have seen people drinking the "table wine" from other tables where those others choose not to drink their table wine. Please also consider the many people who have to drive home from the wedding yes the "designated drivers" they really don't like being isolated from the group because they have to abstain ... a fact that might make them feel like outsiders! Weddings always have toasts to the bride and groom ... etc... etc. Why not choose non-alcoholic sparkling white oralcohol free sparkling peach. 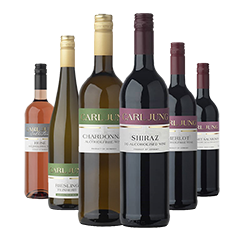 Jungwines has a discount program for supplying dealcoholized wine for these weddings. If you purchase enough nonalcoholic wine that we can build a " mini pallet" to save you some shipping expenses. Just figure out the quanity and kinds of alcohol free wine you need for your wedding and include your zip code when you email us for a quote. We naturally will discount the dealcoholized wine cost too... depending on the quantity ordered. We will respond to your request quickly.